Reid, left, with Cheryl Poulopoulos, current director of the Seaside Pavilion. Assistant Town Manager V. Louise Reid is the spirit and soul of Old Orchard Beach. V. Louise Reid’s office on the third floor of the Old Orchard Beach town hall has a view that even corporate CEOs would envy. From the window behind her desk, I watch the waves roll in to a stretch of white sand beach, deserted on this bleak midwinter day. In a few months, the beach will look more like the paintings and photographs decorating Reid’s office walls—packed with vacationers enjoying the sun, sea, and amusements in one of Maine’s most popular summertime resorts. 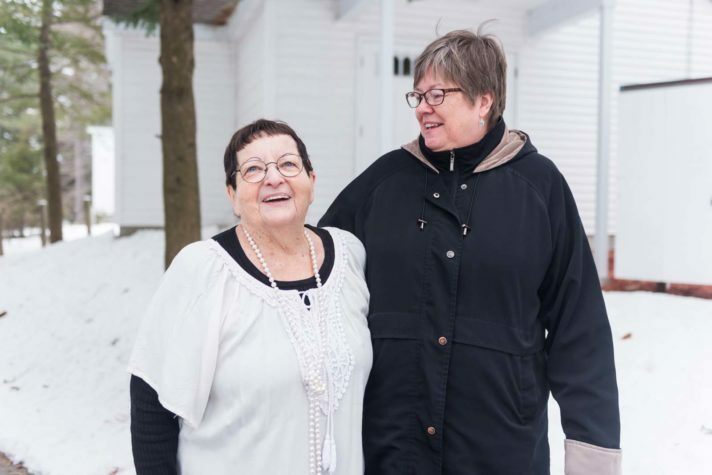 While her view may change, Reid’s position as assistant town manager remains much the same in all seasons. Through 14 years and six town managers, she has been a stalwart constant in Old Orchard Beach. I’m charmed and fascinated as Reid tells her story. Born in Toronto, her childhood dream was to be an opera star. In her teens, she won a scholarship to the Eastman School of Music in Rochester, New York, to study voice and piano. She and her mother (her father had died when Reid was an infant) moved to the United States and Reid became an American citizen. A life in opera, however, was not to be. “I learned quickly at the Eastman School of Music, ‘You have a beautiful voice, and you’ll do very well singing in the choir,’” Reid says. Instead, she followed her mother into the Salvation Army. 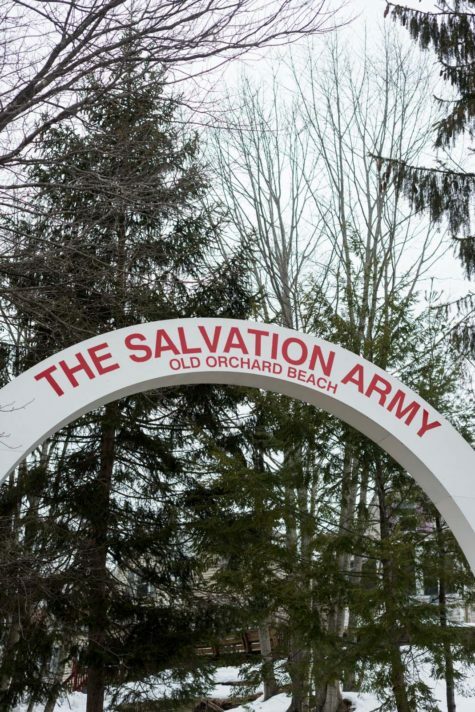 According to the Maine Historical Society, the Salvation Army’s history in Old Orchard Beach dates back to 1885, when the organization began to hold meetings in the pine grove that was part of a summer colony established by Methodists in 1873. As officers, the Reids lived next to the corps headquarters. Like many in Maine they didn’t often use their front door, but one chilly fall evening Louise heard something on the front step. “I said to Bob, ‘It must be an animal or something.’ He went around and it was a three-month-old baby.” They eventually adopted the baby boy, naming him Robert Kevin. “His birthday is July 24, and three years later to the day, our biological son, Bill, was born,” Reid says. Four years after that, the couple adopted a baby girl named Kori, from Korea. By that time, the Salvation Army had transferred the family to New York, followed by Pittsburgh. “Then we decided to leave the work,” says Reid. “I sensed things were starting to change, and I could never put my finger on it.” They moved back to Rochester, where she went to work for the manager of a local ABC television affiliate, and where, after 17 years, the marriage came to an end. Until his death in 1996, however, Louise and Bob remained friends. 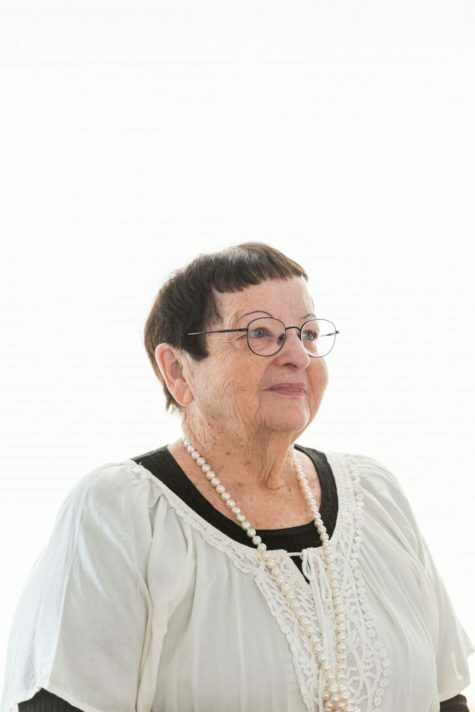 “He was very philosophical—I learned a lot of lessons from him,” she says. V. Louise Reid has served under six town managers during her 14 years in Old Orchard Beach. 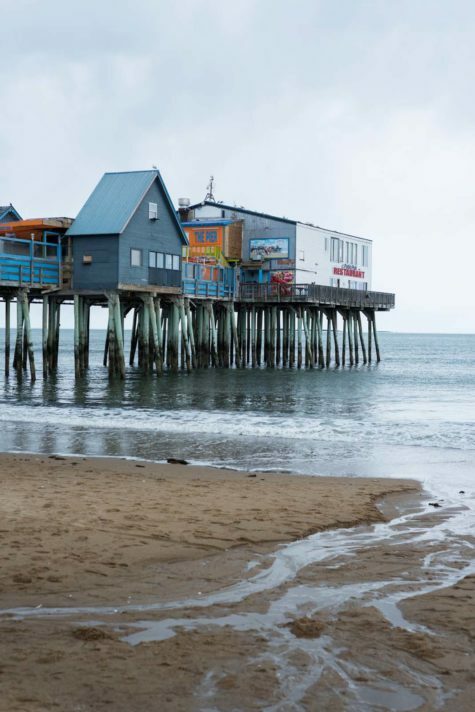 The iconic pier on Old Orchard Beach will soon be crowded with summer visitors. The entrance to the Seaside Pavilion, whose construction Reid managed for the Salvation Army.